(U) Summary: Incidents involving the theft of fuel (gasoline, diesel, kerosene, ethanol, etc.) from fuel storage tanks have been reported across the United States. Fuel theft has significant health and safety implications, including risk for spills, fires, and explosions. Fuel thieves typically do not adhere to security standards or practices, and may inadvertently expose fuel to a hot engine, lit cigarette, or ignition source. First responders and other maintenance personnel also may be exposed to fuels through skin contact or inhalation routes during recovery and/or cleanup operations, which can result in potential health effects. (U) There has been an uptick in reported fuel thefts nationwide. Individuals have siphoned fuel via a hose and drilled holes into fuel storage tanks—typically vehicle fuel tanks or underground storage tank (UST) systems—to access and drain fuel. Additionally, specially- designed vehicles, such as vans and motorhomes, have been equipped with a pre-cut hole in the floor boards and positioned directly over UST systems to inconspicuously siphon fuel through the hole into the vehicle. (U) On 21 March 2014 in Gates, New York: Individual(s) used a power drill to steal gasoline from the tank of a parked vehicle. (U) On 31 January 2014 in Northampton County, Virginia: 600 gallons of diesel fuel was stolen from tractor trailers. (U) On 7 January 2014 in Compton, California: Three individuals were arrested for grand theft of diesel fuel after parking a van over a UST system and siphoning 275 gallons of diesel fuel. (U) On 22 December 2013 in Portland, Oregon: An individual caused a fire after stealing a gas tank from a parked truck while smoking a cigarette. (U) On 6 September 2013 in Anne Arundel County, Maryland: Two individuals were arrested following a two-month investigation of diesel fuel thefts from cellular telephone backup generators. (U) Fuel thieves typically do not adhere to security standards or practices implemented by the US Department of Transportation, US Occupational Safety and Health Administration, and/or critical infrastructure owners and operators. Such safety measures can include flame arresters for fuel tanks, heat shields for exhaust systems, approved steel drums, and flammable liquid markings. (U) Individuals involved in fuel theft may inadvertently expose fuel—a flammable and combustible liquid—to a hot engine, lit cigarette, or other ignition source. These actions may result in fire and explosion risks for the individuals involved in the theft and/or nearby individuals and critical infrastructure. (U) First responders and other maintenance personnel may be exposed to fuels through skin contact or inhalation routes (oral or nasal) during recovery and/or cleanup operations, resulting in potential health effects, such as throat irritation, headache, dizziness, nausea, and breathing difficulties. (U) Drilling holes into storage tanks to steal fuel also creates a potential safety hazard by allowing fuel to leak from its container onto surrounding surfaces. Fuel spills may contaminate surface or ground water, resulting in damage to drinking water and other essential water supplies. (U) Additionally, fuel spills resulting from the illegal transportation, mishandling, and/or damaged storage tanks may create slick conditions on roadways, leading to potential injury. (U) As demonstrated by the aforementioned listed incidents, fuel theft can include both individual and coordinated acts. After the fuel is stolen, it can be resold in the legitimate market or sold on the black market. In cases of coordinated fuel thefts, it appears that the thieves are prepared to steal fuel in bulk, utilizing readily available commercial plastic and metal tanks, fuel pumps, hoses, and plastic tubing. The following incident is a notable example of an organized fuel theft ring. (U) On 4 February 2014 in Tampa, Florida: Five individuals were arrested after allegedly operating a theft ring siphoning diesel fuel and gasoline from farms, ranches, and businesses and reselling it to commercial truck drivers and transportation businesses. 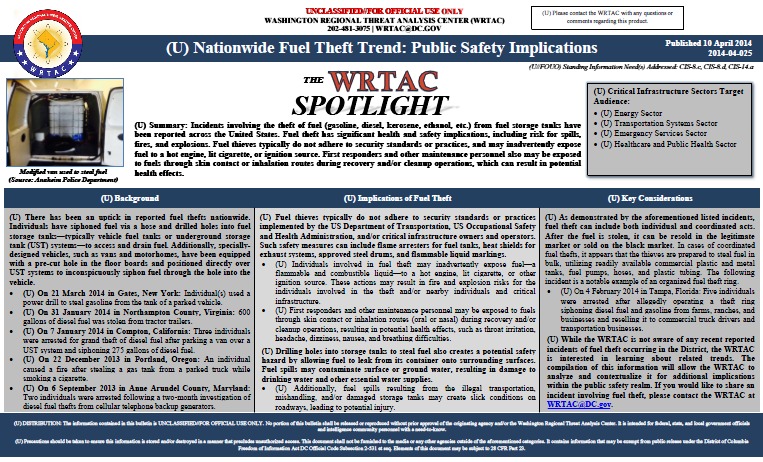 (U) While the WRTAC is not aware of any recent reported incidents of fuel theft occurring in the District, the WRTAC is interested in learning about related trends. The compilation of this information will allow the WRTAC to analyze and contextualize it for additional implications within the public safety realm. If you would like to share an incident involving fuel theft, please contact the WRTAC at WRTAC@DC.gov.